The ofuro (お風呂), is a traditional Japanese bath with deep sides that allows the bather to immerse themselves up to the chin. The ofuro has been used by the Japanese for centuries to alleviate both physical and spiritual maladies. This ancient technique of soaking in hot water takes away tensions and stress, soothes muscular pains, and stimulates the blood’s circulation. The original style of ofuro is very small, barely fitting one person, scrunched up. The water was heated by a wood stove and used by all members of the family and emptied in the evening. It is part of the ritual of bathing and not for washing. Members of the family are completely clean before immersing in the bath. Although no soaps are used in the ofuro, mineral salts can be added to enhance the relaxation. The ofuro were traditionally wooden boxes with 25″ deep straight sides. If you were like me and assumed the small size was due to the small bathroom size and the difficulties of keeping the water hot, you’d be wrong. The size originated from the notion that human beings experienced the best possible conditions in gestation. The small size of the bath required the bather to sit in a fetal-like position. 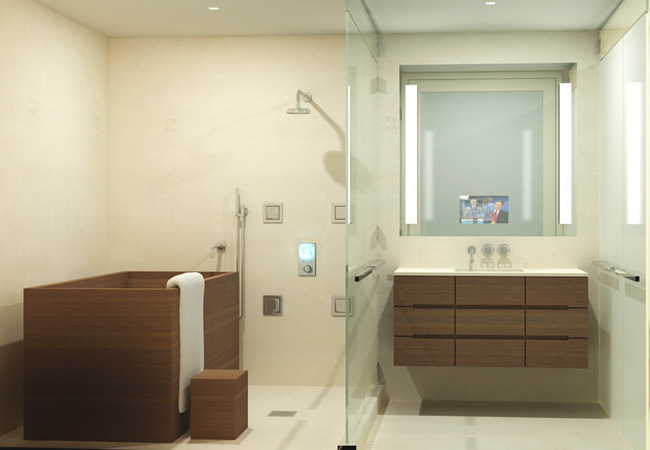 Modern soaking tubs are larger and offer options like bubblers or jets. 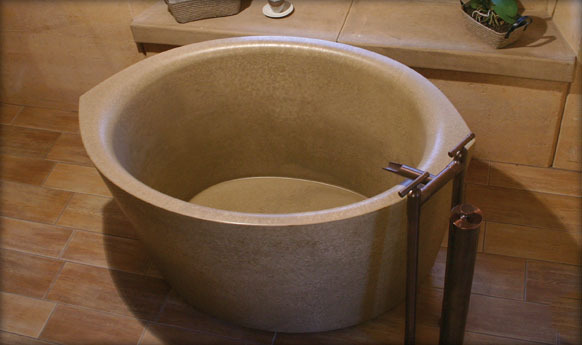 This tub from Sonoma Cast Stone is made from Nucrete and offers the option for a heating coil to be cast into the tub’s body. Ofuro are best designed into wet rooms since most do not have overflow drains. Also, if you follow the bathing ritual, you would shower to clense your body, soak for a minimum of 15 minutes, get out and shower again, soak for an additional 15 minutes and finish with a cold shower. Combining the shower and soaking tub will keep the tracking of water contained. If the extra height of the ofuro has you concerned about your safety entering and exiting the tub, many models can be sunken or partially sunken into a deck. 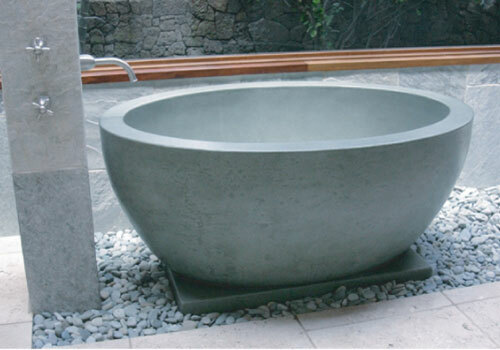 This unique soaking tub from the Zuma Collection features an infinity edge. The tub is partially sunken so the deck is at a comfortable height. Another option is a walk-in style tub. You’ll need adequate floor clearance in front of it but it is a great option if you can’t change the floor. 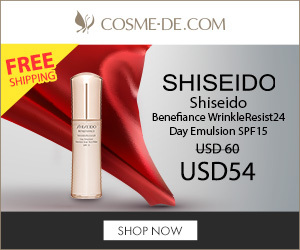 It is also a great option for people who want to stay in their home well into their senior years. Many people prefer to spend their time for relaxation and contemplation surrounded by nature. Unfortunately, many traditional wooden ofuro are not suitable for outdoors. Concrete ofuro, like this one from Concreteworks, are a popular choice because they hold up well to the elements.